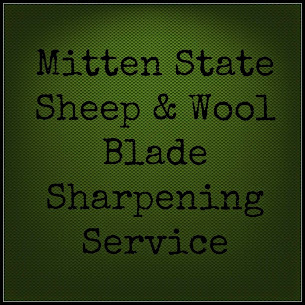 Mitten State Sheep & Wool : Mitten State Sheep and Wool Giveaway! If you follow the blog, then you know I really enjoy raising sheep, I love their wool and spend a lot of my time, playing around with it. Spinning, knitting and most recently dyeing. I also enjoy going to fiber festivals and sheep shows. At the Michigan Fiber Festival I picked up an Ashford Student Drop Spindle for a giveaway on the blog. Also included. is some of our wool roving, and a set of note cards featuring some of our lambs. All that you need to do to enter, is leave a comment, mentioning one way that you follow the farm. Blogger, Google Plus, Email, Facebook, Instagram, Pinterest, etc. The winner will be chosen with a random number generator on Monday, November 3rd. Please check in to see if you are the winner! I'd love to enter please! I want to learn more about this. You know I follow you. I follow you multiply ways (does that sound bad, lol). I have been soaking up every thing you have posted on wool lately. I have quite a bit of raw fleece to process. I follow your blog and facebook page. I'm new to 'fiber', but learning a lot from you - thanks! I have your blog marked in my "favorites" folder so that I can check it daily. Your entries are not only informative but inspiring. Thanks! I am now a follower on Facebook. Would love to be entered! I follow your farm with 'Blogger'. It is happily in my Favorite's bookmark section. I look forward to dying with pokebery after you lead this coming summer. I am budgeting for some nice roving! What a fun giveaway! I am always looking to learn new things and with winter setting in, I could use a new hobby! I follow via blogger. I knit & crochet and would love to learn how to use the drop spindle to spin fiber that I could use for my projects. I follow on Facebook, Pinterest and Email. I followed you on Facebook. I purchased an Ashford wheel but need to learn to use it. I would love to try a drop spindle, you can take that anywhere!! I follow your blog, facebook page, and by email. I love to read your posts, and learn so much! Thank you! I signed up for the emails. I found you through Oakhill Homestead blog. Thanks for the giveaway. Learning to use a drop spindle is on my "wish list". I have followed your blog ever since we have purchased 2 of your fleece lambs. It has been great and I can't wait to use thier fleece this year. I follow on Facebook! I love reading about the neat adventures you and your family take with farm life! Pick me! I follow your blog but would love to find you on facebook also. I will look for you! I follow on Pinterest. You have beautiful sheep. Great giveaway I follow on Facebook and my email! I follow on Google plus, Pinterest, Love your Blog! !..Thank you for the opportunity! I just started following via facebook. I just moved onto a place that has 2 alpacas and a recently acquired ram, and I love to crochet.... dyeing fiber and crocheting something with it is on my bucket list!! following on facebook from Alaska! We love wool products up here, they keep us warm!